Jammu: The Health Department in Rajouri district of Jammu and Kashmir have established separate ward and outpatient department to screen suspected swine cases in the region. “Keeping in view reports of Swine Flu cases in Jammu, Dr Mahmood Hussain Bajjar Medical Superintendent District Hospital Rajouri reviewed the preparedness to deal with any such case in Rajouri and established a separate isolated indoor ward and OPD to screen and manage swine flu cases,” official spokesman here said. He said the Medical Superintendent sensitized health care workers and general public about the disease and took stock of H1N1 drugs and other personal protective equipment available in the District Hospital. Dr Mahmood said Swine flu, is a relatively new strain of an influenza virus that causes symptoms similar to the regular flu. Like other strains of the flu, H1N1 is highly contagious and spreads quickly through saliva and mucus particles. People may spread it by sneezing, coughing, touching a germ-covered surface and then touching their eyes or nose. A simple sneeze can cause thousands of germs to spread through the air. The virus can linger on tables and surface areas like door knobs, waiting to be picked up. He advised that best means of dealing with swine flu is to prevent it. Hand sanitization is important to stop the spread of the virus. Staying away from infected people will also help to stop person-to-person transmission. 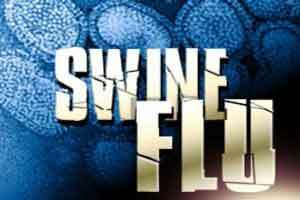 “Some people are at higher risk of becoming seriously ill if they’re infected with swine flu. These groups include; adults over age 65, children under 5 years old, adults and children under 19 years of age who are receiving long-term aspirin (Bufferin) therapy, people with compromised immune systems (due to a disease such as AIDS), pregnant women, people with chronic illnesses such as asthma, heart disease, diabetes mellitus, or neuromuscular disease,” he said.